People are at the heart of every company. People want to work for businesses that are socially responsible and buy from companies that put goodness first. The actions of people are what will create a Singapore where every organisation is giving back in one way or another. Together, we will build a City of Good. What is Company of Good? The Company of Good programme was launched on 2 June 2016. It was developed by the National Volunteer & Philanthropy Centre (NVPC), in partnership with the Singapore Business Federation Foundation (SBFF), supported by the Ministry of Culture, Community & Youth (MCCY), and in support of Singapore Cares (SG Cares). We empower businesses operating in Singapore to give in strategic, sustainable and impactful ways. Increasingly, consumers are seeking ethical products and services, and people want to work for companies that care about the communities they operate in. Creating a strong business and building a better world are not conflicting goals. Rather, they are both essential ingredients for long-term success. At Company of Good, we help companies to do good well, and to benefit both their business and the community while doing so. "Does your company give in more than one way that is aligned to the vision, mission, strategy and/or nature of your business?" "Does your business also advocate a social cause or does your business procure from charities?" "Does your company provide paid volunteer leave or recognise outstanding employee volunteers?" "Does your company set up processes to measure the input, output, outcome and impact of your giving?" Who Should Join Company of Good? Are you new to corporate giving? Or a CSR practitioner helping your company expand its corporate giving efforts? 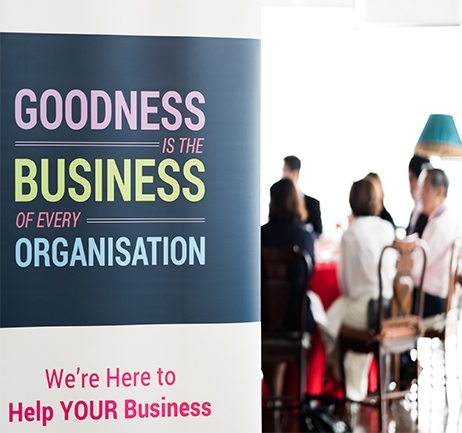 To date, Company of Good has over 1,000 corporates comprising both large enterprises as well as small and medium-sized enterprises that have benefited from our corporate giving resources, as well as programmes, events and workshops.